The modern city does not have a single religious and moral monolith. Nor is it governed by a single oligarchy but by coalitions of persons responding to the interests and desires of people and their institutions. Economic and political leaders have more power than others, to be sure, but even they must wait for the tides and marshal support where they can. Religious and moral power curbs or abets the tidal movements but is not their source. Churches that care about the city must have a Federation that is adaptive to the churning grinding environment of the city. It will listen and watch to learn what the city is doing to its poor, its children and youth, its aging, its minorities, its churches. It will look for those leaders of public spirit it can encourage and with whom it can link arms. It will confront those who abuse power and exploit one another. This it can do only so long as there are ministers and lay leaders in the churches who claim the city as their home and who care enough to give their energy and substance to keep it a just and livable home for all its citizens, even its least. 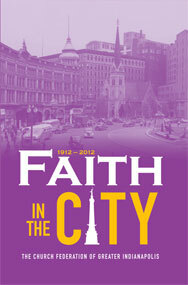 The Church Federation of Indianapolis arose from the efforts of people who embodied a commitment to a vision of a City of God, a commitment that has taken different forms across seventy-five years. Recalling its history may lead to new expressions of that commitment in the decades ahead.